Reflection is such an important part of the learning process. By reflecting on our experiences, for example by sharing the strategies we used that were successful for solving a math problem, or by thinking about why that science experiment didn't quite work out the way we had planed it, we take away important new understandings that we can remember and use in the future. 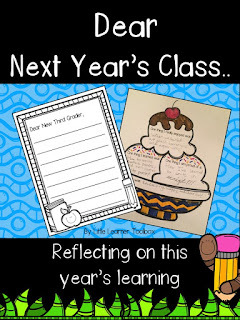 One way to incorporate reflection in a fun and meaningful way at the end of the school year, is by writing a letter to 'Next Year's Class'. You can use this fun project as a way of looking back over the years achievement and events and next year's class will love it too! What are the important things that next year's class should know about for next year? Are there things that were exciting to learn this year, or any fun activities or trips? Maybe they could reassure anxious incoming students that the next grade isn't as scary as they think. By writing letters to incoming students, your class get to create reflections at the end of the year AND you get to create a book of welcome letters for your new incoming class. Or you could put a letter on each new student's desk on the first day of school at the start of the new year, and then bind the letters to make a book for the class library.